Art galleries and art museums are both places to see and experience art. 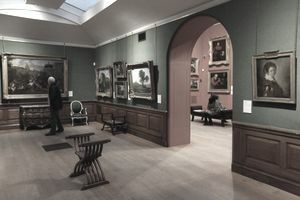 Galleries and museums share some characteristics; for example, the artworks are typically shown in pristine empty spaces with minimal distraction and controlled lighting to showcase the exhibited art. This controlled setting allows the public to engage with the art in a specially-created aesthetic environment. Despite these obvious similarities, there are some major differences between an art gallery and an art museum. As an art lover or artist, it's important for you to know these differences. An art gallery is a small business that sells the art it exhibits. The profits made from sales will cover the operating costs to run that business, and, in a successful gallery, will also turn a profit. An art gallery also has a stable of artists unified by some criteria such as tone or feeling of the artworks; a common background of the artists; or a shared style, technique, medium or similar outlook. Artists typically receive payment for their work when it is purchased, minus a percentage taken by the gallery for representing the artist and showing his or her work. Most galleries have a specific artistic focus. For example, some galleries may only specialize in contemporary art, while others will only show landscape painting. Some are dedicated to one or a group of individual artists. A gallery typically has a monthly exhibition, promoting it with print ads and phone calls to potential collectors and the press, and hosting an art opening. Galleries become a brand representing a certain aesthetic point of view. Ultimately, though, the art gallery is in the business to promote its artists and sell their artworks. The gallery staff will also spend considerable time with potential clients in educating them about their stable of artists. Art museums, unlike art galleries, are almost universally non-profit entities which adhere to the mission statement set forth by the founders. Most art museums have specific missions; for example, they may focus on the works of a particular artistic school, selected media, regional art, or even the works of a single artist. A board of directors and trustees oversee the museum, while an appointed director and a hired staff of curators, registrars, conservators, handlers, security, administrators and other arts professionals take care of the daily operations. Many museums receive museum accreditation from an organization such as the American Alliance of Museums; such accreditation provides strict guidelines for a museum to follow. It's important to note that the rooms in which art museums display their works are usually called "galleries." These rooms in museums should not be confused with for-profit, standalone art galleries as described above.